People in your congregation probably don’t understand PPSD. They are quite happy to chat with you after you have preached. They might want to talk about other things (that can be tough – it feels like they ignored you completely). They might want to talk about your message (that can be tough – you may feel too vulnerable at this stage). They might want to discuss some detail in your message (that can be tough – your purpose and big idea related to major life change, but their discussion might revolve around some incidental element, or even be a misunderstanding of what you said). 1. Create a small team who do understand. Your spouse would be a wise place to start. After all, church requires up to an hour of complex interactions. Then you go home. It may not subside for another 36 hours! Also, bring it into the conversation with your preaching team. This could be other people who preach, or people who help discuss, plan, pray or feedback on the preaching ministry in the church. None of us should try to do a preaching ministry alone . . . you need a team and they need to understand PPSD. 2. 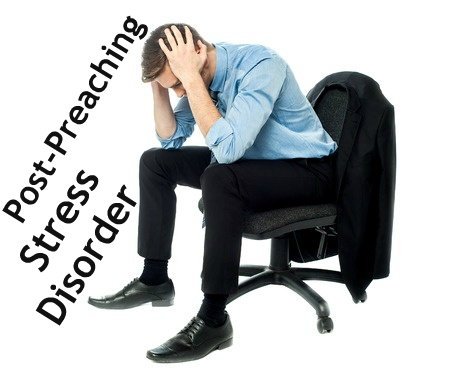 Let PPSD push you up against God in post-preaching conversation. The danger is that we go it alone and end up crashing in some way. Some will struggle with discouragement or depression. Some will struggle with self-absorption and time-wasting. Some will struggle with temptation and specific sins. Some will struggle with a combination of these and more. Some will struggle sometimes. Some will struggle every time. We are not designed to go it alone! Let the PPSD push you up against God so that you take time to prayerfully reflect after preaching. Maybe a Sunday afternoon walk. Maybe a Monday morning prayer and reflection time. You cannot leave God out until Tuesday and then start the process again. 3. Make notes during PPSD and review later. It is not the time for massive ministry decisions, or self-critique, etc. Know that your thinking is cloudy at this point, so make some notes and then look at them later in the week. Learn, but keep it in context. Ideally talk it through with others who will be honest with you. It may be that your perspective is all skewed. Or it may be bang on. Either way, you will learn more in the context of a team. Thanks for this, Peter. It helps me know better how to pray for those of you who are preachers. It gave me a lot of new insight. I could relate it to the emotional and mental exhaustion I sometimes feel after coming home from my work as a nurse caring for cancer surgery patients. Very much appreciated!